Chainfree Bristol - NOVEMBER 20112 NEWS! Kira, a beautiful Siberian Husky, is 1 1/2 years old and has lived her life chained most of that time. Chained at the rear portion of the yard, Kira lived far from her owner-family. Chainfree Bristol built a large fenced enclosure close to the home where the pet owners can interact with Kira each time they enter or leave the home. Now Kira is chain free and SMILING!! Thanks to Chainfree Bristol Donors and Volunteers in 2012: Stephanie, Shannon, Big orange Realty, Mia, United Southeast Federal Credit Union, Chrystal, Michael, Charles, Debbie, Teresa, Tony and Elizabeth, Helene, Diane B, Lois, Bob, Connie and Joe, Judith and John, Jamie, Sue at Holly Help, Carolyn with Pet Dairy, Animal Rescue Coalition, Pet Partners, State Street Sweets and Eats, Realty Executives Bristol, Wise Recycling, The Paramount Theater, K and K Tires, Coldwell Banker Securities, Joanne, Elizabeth H., Michael A., Debbie M., Pete, Eden, Les, Jake, Shea, Anita, and all the CFB Volunteers! Here's How You Can Help: 1. Contribute time and work. Volunteer to help build fences for folks who would let their dog off the chain if they had an appropriately fenced area in their yard. Materials and direction to be furnished by Chainfree Bristol. 100% of contributions fund fencing materials to release chained or tethered dogs. For more info contact: Liza at liza@chainfreebristol.org or 423-534-9755. CHAINFREE BRISTOL LOOSES MENTOR! Peggy Irwin, founder of ChainFree Asheville, has died. She was 64. 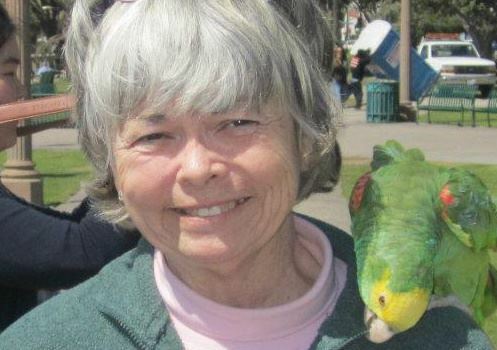 In 2009, Peggy Irwin was instrumental in having the City Council review animal ordinances, resulting in a ban on the unattended chaining dogs in Asheville. Peggy Peggy Irwin certainly inspired Liza Conway, Executive Director of Chainfree Bristol. “Peggy helped us with information needed to acquire our 501C3 status. She and her husband, Pat, came over from Asheville and helped us build our first fence. Peggy was an amazing person: so giving and so passionate. With every fence we build, with every step closer we get to a legislated ban, and with every dog freed from chain or tether, we will think of Peggy and the example she set for all of us!" Fairhope, Alabama; Fayetteville, Jonesboro, Little Rock and Maumelle in Arkansas; Collier County, Hillsborough County, Miami, Miami-Dade County, Okaloosa County, Palm Beach, Sarasota County, and Seminole in Florida; Athens-Clarke County, Chatham County, and Terrell County in Georgia; Frankfort, Kentucky; Carthage, Missouri; Asheville, Chapel Hill, Cumberland County, Clayton, Davidson, Durham County, New Hanover, and Roanoke Rapids in North Carolina; Lawton, Oklahoma; Beaufort, South Carolina; Arlington, Big Springs, Dallas, Electra, Fort Worth, Georgetown, Irving, Nassau Bay, Texas City and Nassau Bay in Texas; Hampton, Virginia; Kanawha County in West Virginia! Let us add Bristol, Tennessee (and other cities in our region) to this list! Call your City Council Person today and express your opinion about chained dogs!